Alpine, Texas—In a tiny and remote West Texas town, pipeline protesters are following in the footsteps of those at Standing Rock. Two residents of the 6,000-person city of Alpine were arrested early Tuesday morning on grounds of trespassing after they chained themselves to the entrance gates of a pipeline-construction site owned and operated by Energy Transfer Partners (ETP), the Dallas-based energy company responsible for the Dakota Access Pipeline (DAPL). Dozens more stood by, holding electric tea lights and signs denouncing the energy company. Inspired by the fight against the DAPL near the Standing Rock Reservation in North Dakota, the group was protesting a different ETP pipeline project. The Trans-Pecos Pipeline will cut through the spare and pristine Big Bend region of Texas to the border of Mexico, transporting natural gas into Mexico’s interior. This was the latest in a more-than-two-year battle to halt the pipeline’s construction, during which its opponents have fought vigilantly, albeit through more institutionalized avenues. Since news of the pipeline began to spread in the spring of 2015, residents concerned about the environmental impact of the pipeline and its infringement on private land have collected signatures and rallied the support of local governance. They sat through condemnation hearings, and even filed suit against the pipeline company. They filed more than 600 comments with the Federal Energy Regulatory Commission, the agency responsible for regulating the small segment of pipeline that would stretch beneath the Rio Grande, and requested that the entire length of the pipeline be subject to environmental review. Their request was denied in May of this year, and ETP continued construction at full steam. Many feel their voices have fallen on deaf ears. 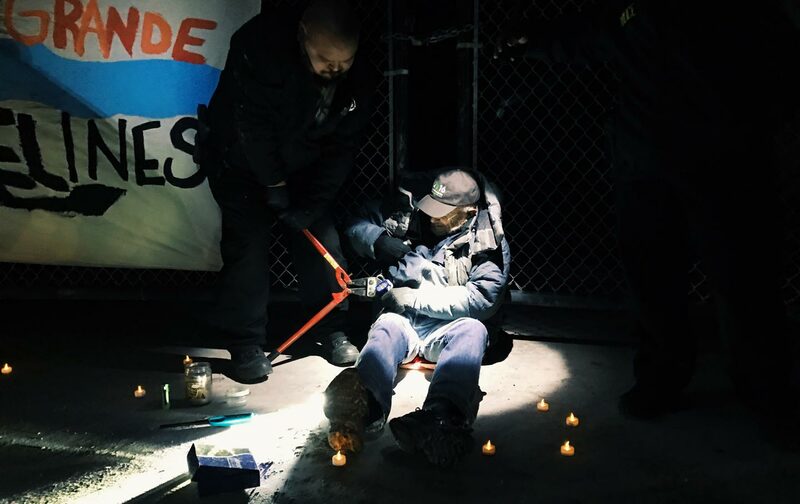 Now, tired and disillusioned after years of protesting, and with the pipeline very near completion, opponents of the Trans-Pecos Pipeline are trying direct action for the first time. This week’s victory at Standing Rock, in which the Army Corps of Engineers announced it would not permit the pipeline to be drilled under the Missouri River, underscored the power of direct action. Indigenous organizers and, eventually, thousands of supporters camped on the banks of the Cannonball River to protect their ancestral lands and water source. Their united action, even in the face of police violence, proved that last resorts can work. In fact, the events at Standing Rock have inspired the opposition to rethink their approach entirely. At a recent meeting, during which the opposition clandestinely discussed plans for Tuesday’s action, they talked about shifting the verbiage of their protest to more closely resemble that of the protest in North Dakota. The group also discussed making water the focus of their protest to echo the “water is life” motto of the Standing Rock movement. After all, they said, the Trans-Pecos Pipeline would cross beneath the Rio Grande, as well as a handful of regional watersheds. But some among them worry that folding their fight into the movement at Standing Rock might undermine other significant issues highlighted by that fight—namely, the centuries-long mistreatment of indigenous tribal communities in the United States. Indeed, theirs is just one regional pipeline fight among dozens like it that are taking place across the nation, with local residents embattled in near-identical fights. In West Virginia and Virginia, for example, residents concerned about the $3.5 billion Mountain Valley natural gas pipeline have formed an alliance to oppose the project, which they say threatens their underground water supplies. Resistance is also gathering against the Bayou Bridge pipeline, another ETP project, which would snake through 60 miles of Louisiana and Texas. Still, few outside these and other municipalities engaged in local pipeline fights have taken notice. “The system is rigged against us,” was a common refrain at Tuesday’s protest in West Texas. But those fighting for their sacred land and water rights at Standing Rock have accomplished what few other pipeline protests could—they’ve garnered national media attention. Opponents of the Trans-Pecos Pipeline are eager to do the same. “Even if we don’t stop it altogether, we’re bringing a lot of awareness to this issue in order to pressure, to get our government to change oil and gas infrastructure regulation,” Glover said. As protesters stood in the early morning darkness beneath a sky replete with stars—one of the biggest draws to the region are its dark skies, which opponents say could be affected by the pipeline infrastructure—they began to sing the popular Woody Guthrie song, “This Land Is Your Land,” but they changed a few of its verses. Sasha von OldershausenSasha von Oldershausen is an Iranian-American journalist writing about the Texas-Mexico border. Her work has appeared in The Paris Review, The Guardian, and Texas Monthly, among others.